Saudi Human Rights Commission: Suspects In Khashoggi's Death Brought To Justice The kingdom's leading human rights leader said demands to "internationalize" the probe would be "tantamount to the international community doubting the integrity of our judicial apparatus." President of the Human Rights Commission of Saudi Arabia, Bandar bin Mohammed Al-Aiban, pictured in November, told the UN Human Rights Council on Thursday the accused killers behind Jamal Khashoggi's death are being brought to justice. "We have taken those measures required for us to resolve this heinous crime," Aiban said, after calling the reporter's death an "unfortunate accident." Khashoggi, who worked as a contributor for The Washington Post, was an outspoken critic of Crown Prince Mohammed bin Salman. He was killed inside Saudi Arabia's consulate in Istanbul on October 2. Aiban said the case against the suspects is ongoing and so far, they have appeared in court for three hearings with their lawyers present. 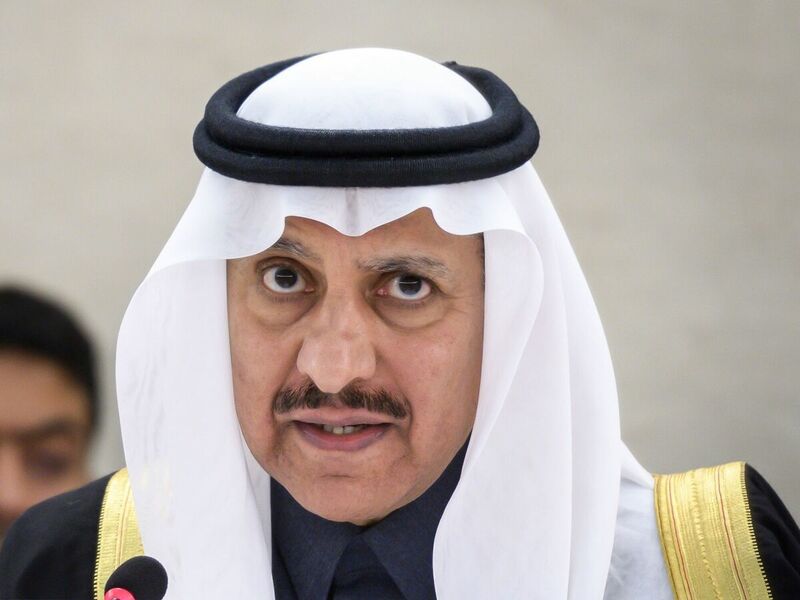 While he provided no names or details about the men who have been charged, he assured the 47-member council that Saudi Arabia is adhering to its own constitutional principles as well as international law. "None of their human rights have been violated and they have been subjected to no form of torture or cruel" treatment, Aiban clarified. The kingdom, he said, will not accept calls to "internationalize" the legal proceedings, which would be perceived as foreign interference with domestic affairs. He added that any demands by foreign countries or bodies to launch an international investigation would be "tantamount to the international community doubting the integrity of our judicial apparatus." Aiban's statements come a week after a rare censure of Saudi Arabia by 36 countries demanding transparency into the Khashoggi investigation. In a statement read by Iceland's U.N. ambassador Harald Aspelund, the group said, "Investigations into the killing must be prompt, effective and thorough, independent and impartial, and transparent. Those responsible must be held to account." Khashoggi's death sparked international outrage and focused a global spotlight on the crown prince. Saudi Arabian officials initially denied Khashoggi was killed, then they claimed he died in a brawl and eventually admitted the killing was premeditated. More than a month after his death, the CIA concluded Salman ordered Khashoggi's death. On Thursday, critics of the government's handling of the investigation, including Yahya Assiri, a Saudi human rights activist, noted the omission of any mention of the kingdom's powerful crown prince. In an interview with Al Jazeera, Assiri said Aiban's refusal to allow an international independent investigation suggests officials at the highest levels "are hiding something." "They are hiding the name for the person who ordered this operation. The person who ordered this operation is still safe and he is still leading the country," Assiri said, referring to Salman.